I sincerely hope that I’m below the radar of the food-blog-police, or I may be in trouble for posting too many zucchini recipes. Without a doubt, to my mom’s shock and disbelief, zucchini is one of my favorite vegetables. While growing up I wouldn’t even try it, little did I know my how much my tastes would change! The first time I tried this recipe was more than 20 years ago; it comes from an old, out of print cookbook by Giuliano Bugialli. It’s unusual because this “torta” takes no flour. 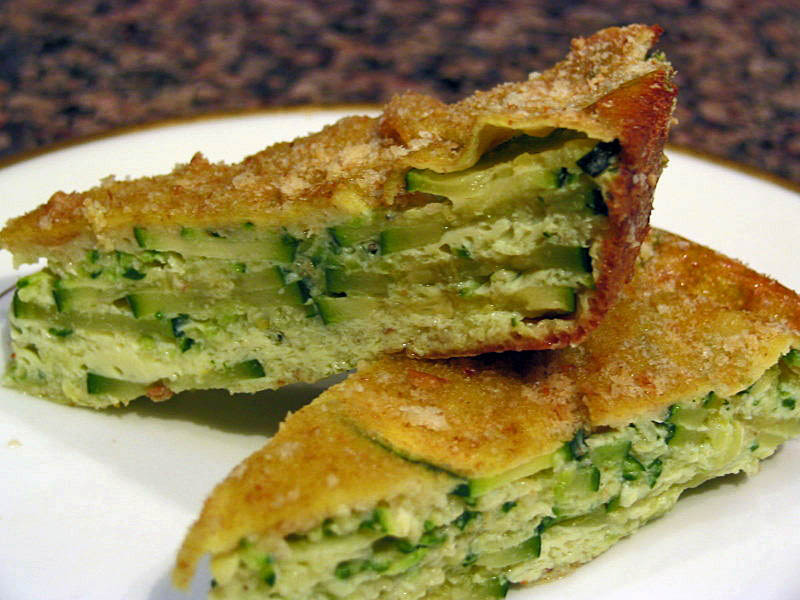 It also contains zucchini cut in two different ways: grated and sliced. The grated component becomes creamy during baking, surrounding the more defined slices to form a light, refreshing, sort of crust-less quiche. By skipping the breadcrumbs, this recipe is also low in carbohydrates, for those who are counting. Grease a pyrex pie dish with butter. Sprinkle some bread crumbs to coat. Mix the beaten eggs with the lemon zest, parmiggiano cheese, 1/4 cup of bread crumbs, parsley, salt and pepper. 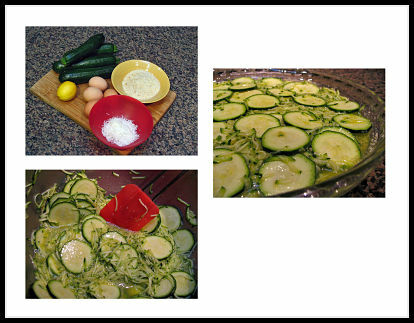 In another bowl, place the grated and sliced zucchini. Shake the dish carefully to distribute the slices more or less evenly. Add the egg mixture to it, mix gently, and pour into the prepared pie dish. Sprinkle the remaining 1/4 cup of bread crumbs on top, forming a very light coating. Bake in a 375F until set and golden on top. Allow it to cool for at least 15 minutes before serving. Serve warm or at room temperature. Comments: This “torta” makes a nice light meal, possibly served with soup or a salad. In the summer I like to match it with tomatoes from the garden or from the farmer’s market. Leftovers are best re-heated in the oven, because microwaving tends to make it watery.